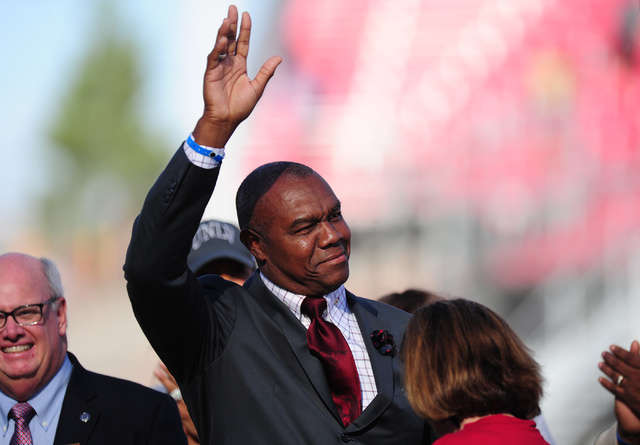 Randall Cunningham, who starred at UNLV from 1982 to 1984, will become the school’s first inductee into the College Football Hall of Fame in December. 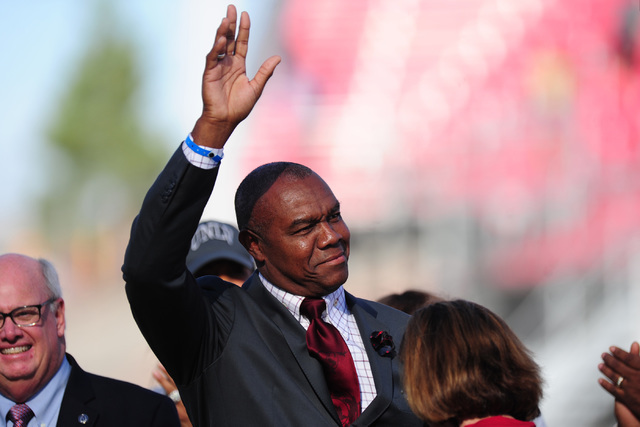 When Randall Cunningham first heard of the effort to get him inducted into the College Football Hall of Fame more than a decade ago, he brushed it aside as a nice potential footnote to his legendary career. The prestige of the honor didn’t really hit him until he got a call in January that he had been selected on his 11th time as a finalist on the ballot. The former UNLV star will officially become the school’s first inductee in December at the National Football Foundation Awards Dinner in New York. 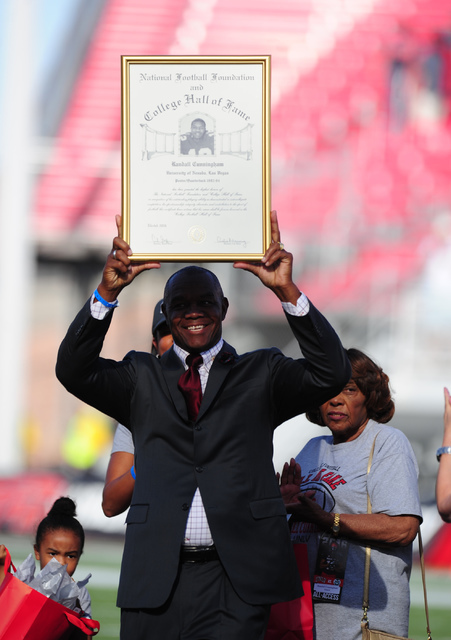 “Coach (Harvey) Hyde was really (lobbying) to get me in, and I always just kind of thought, ‘Well, if it happens, it happens,’” the 53-year-old said Saturday after he was honored for the achievement on the field at Sam Boyd Stadium during UNLV’s 42-23 loss to Colorado State. “But when it happened, Oh, my God, I almost lost it. Cunningham, now the Silverado High School football coach, is the leading passer and punter in school history. He still has 13 school records, including passing attempts (1,029), completions (596) and yards (8,020). Cunningham, whose UNLV career spanned from 1982 to 1984, also holds the punting average marks for a game (58.0), season (47.5) and career (45.6). His best memory from his collegiate days came from off the field. Cunningham remembers a meeting between the seniors and Hyde at Sam Boyd Stadium before the Rebels hosted No. 10 Southern Methodist in the final game of the 1984 season. UNLV finished 11-2 and defeated Toledo 30-13 in the California Bowl. Cunningham was named a first-team All-American as a punter in 1983, a requirement for eligibility in the Hall of Fame. Cunningham played in the NFL with Philadelphia, Minnesota, Dallas and Baltimore. Sophomore kicker Evan Pantels has been a terrific addition to the UNLV program after transferring from Georgia Military College. Pantels, who also serves as the Rebels’ punter, had not missed a kick this season entering Saturday’s game. He was 6-for-6 on field goals, including the game-winner last week at Hawaii, and had made all 30 of his extra points. But that changed in the first quarter when Pantels missed a 41-yard field-goal attempt wide right. He redeemed himself with a 27-yard field goal in the third quarter. Pantels also made both of his extra points and averaged 44 yards on four punts. Bishop Gorman High School alumnus Justin Sweet played well in his return to Las Vegas. The junior, who is listed as a second-team strong safety, had one tackle and one pass breakup. He also alertly recovered a throw from Dalton Sneed late in the second quarter that was ruled a lateral, giving the Rams possession at the UNLV 11-yard line and setting up a touchdown to make the score 35-0 at halftime.